A Level 1 easy reader about a funny little dog--with wonderfully humorous illustrations! When Dad tells Buddy to sit, Buddy stands up and barks. When Dad tells Buddy to stand up and bark, Buddy sits! Mom tells Buddy to get the paper; Buddy rips it. Brother Pete tells Buddy to roll over--and Buddy takes Pete's shoe and runs away! Only the little boy in this story knows how to get Buddy to do what he should--with hugs and cuddles and lots of love! 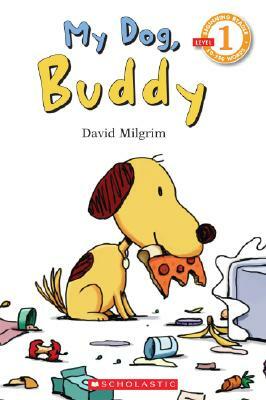 New readers will love this funny story about a boy and his dog!